If you are/were a Twilight fan or you have one in your life, this is a great gift idea for the holiday coming season. I can’t think of a better way to celebrate ten years than to get this movie on 4K UHD. It's hard to imagine that it has been ten years since Twilight first graced the big screen. In 2005 the vision of writer Stephenie Meyer was published and became a sensation not only amongst young adults but by adults as well. Edward, Bella, and Jacob captivated people's imaginations and spawned three more books and a total of five movies. In 2008 the first of those movies, Twilight, brought the written words to life, created a frenzy and made stars out of Robert Pattinison (Harry Potter and the Goblet of Fire), Kristen Stewart (Snow White and the Huntsman) and Taylor Lautner (Abduction). Ten years later it is being released on 4K for audiences to enjoy at home. Bella (Stewart) is a moody teenager who decides to go live with her Dad (Billy Burke; Fracture) in Forks, Oregon so her mom and stepdad can travel for his baseball career. At her new high school, she makes a nice group of friends but her attention is drawn to Edward Cullen (Pattinson). He, along with his siblings, is secretive and pretty much keep to themselves but Edwards also seems to be drawn to Bella much to his chagrin. Jacob (Lautner) tries to warn Bella to stay away but the mutual attraction seems to be too strong to resist. After putting two and two together, Bella learns the truth about Edward and the rest of the Cullens – they are really vampires. Despite this tricky fact Bella and Edward begin a relationship that becomes the obsession of another vampire, James (Cam Gigandet; Burlesque) who sees Bella as his greatest challenge. Suddenly a game of cat and mouse has Edward doing everything in his power to protect Bella from this hunter who is out to kill her. The Cullens eventually defeat James and Bella ‘s life is changed forever by the knowledge she has recently acquired. Pattinson is physically perfect for the role of Edward with his chiseled facial features and his statuesque physique but his acting is less than stellar here and both he and Stewart seem mopey. Stewart's "ticks" are more annoying than endearing and her somber demeanor is more moody than thoughtful. Lautner is the best of the three here as he is more animated than the other two. The supporting cast is fine considering the material they are working with. The script is cheesy and cliché but then again so are the books and neither is well written. The 4k video quality is the best version of this movie to date. The 2160p resolution is "crystal" clear (pun intended) and really showcases the magnificent scenery of the northwest United States even on its dreariest days. The Dolby Atmos audio is truly wonderful here with clean dialogue and a crisp soundtrack that offers eclectic musical offerings. The combo pack has a number of extras on both the 4K and regular Blu-ray discs. 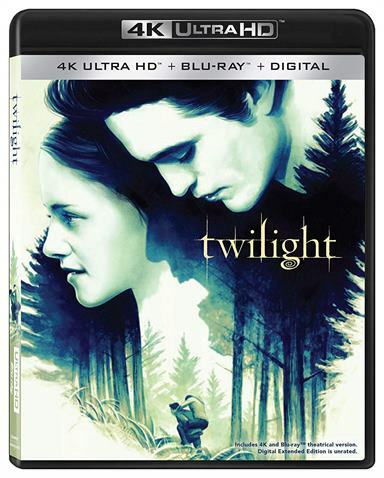 The 4K includes some great, new material including Twilight Tour…10 Years Later and A Conversation with Stephenie Meyer. The Digital HD copy of the film is also an unrated, extended cut with new scenes. Fans will definitely enjoy these additions to some of the previously released features. This film brought to life characters that millions of fans envisioned and created a frenzy among tween and young adults alike (and some not so young adults as well). No matter how you feel about this saga, it's nice to see it get the 4K treatment like so many other films these days and this combo pack is surely a treat for those who enjoyed the movie the first time around. If you are/were a Twilight fan or you have one in your life, this is a great gift idea for the holiday coming season. I can't think of a better way to celebrate ten years than to get this movie on 4K UHD. Download Twilight from the iTunes Store in Digial HD. For more information about Twilight visit the FlickDirect Movie Database.